Which Came First the Chicken or the Egg and Where Did Chickens Come From? Many weird religions would say the chicken came first without hesitation, claiming that their god created the animals and birds complete and without evolution or change. However, evolutionary evidence more strongly supports the egg-first theory. Genetically, chickens can be traced back to an earlier bird found in Indochina called the red jungle fowl. It produced a bird much more closely resembling a chicken than a red jungle fowl. 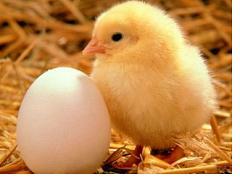 So the egg came first, and shortly afterward the chicken was born, becoming a fixture on farms everywhere. Why Can’t Chickens Fly, How Far Can Chickens Fly, and What is the Longest Distance Flown By a Chicken?